If you are chomping at the bit to get outside and play in the dirt, your chance is almost here. According to the Farmer’s Almanac, our last Spring frost should be around April 18. After that, you should be good to go to get plants in the ground. Getting your Spring garden and yard checklist done means rolling up your sleeves and cleaning out those flower beds. Get busy, you have a lot to do! If you need reminding which hardiness zone you live in, you are not alone. Our state seems to be laid out like a jigsaw puzzle. Still, they say we are looking at 182 days of great gardening weather ahead, so bring it on! Get your Spring gardening checklist in order. Tackling some of the list now will give you more time to focus on planting new varieties once the last frost has passed. Remove dead plants – If you didn’t do this during the Fall/early Winter, do it now. Test the soil – Harsh winters can deplete nutrients. Testing will let you know how to amend it before planting. Weeding and composting – Pull early weeds now before they take hold. Amend your soil with compost, manure or new top soil. Prune perennials – Many die back to the ground in the Winter. If you have dead growth stalks, don’t cut them until you see green at the base. Cut back ornamental grasses – Get rid of old growth. Roses – Inspect them for diseases and remove dead limbs. Trees and shrubs – Prune spring flowering plants after they have lost their blooms. Evergreens – Fertilize them with specially formulated food. Divide and transplant – Separate perennials to prevent overcrowding. Start a new bed or share the extra plants with friends. Mulching and edging – Give seedlings an opportunity to peek through before covering them up. Let the soil warm up and dry out slightly before adding mulch to avoid encouraging mildew. Edge your beds to keep grass at bay. 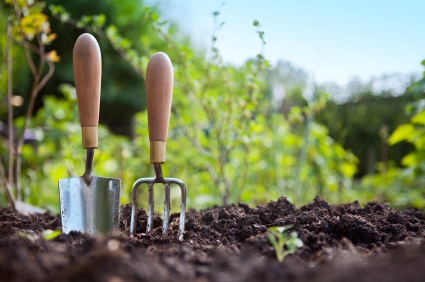 Spring gardening projects are not limited to planting and mulching. Inspect your landscape for any basic repairs that are needed like dead tree removal or broken branches. Retaining walls may need shoring up or replacing. Bird feeders and chicken coops need cleaning. If you don’t have a compost bin, now is a great time to build one. If you are as excited about the warm weather as we are, you won’t mind having a list of things to do. Are you ready to play in the dirt? Need a few more outdoor projects? This handy list, 11 Lawn and Gardening Tips for Spring, will round out your DIY to-do list. From Honda tillers and trimmers to edgers and wheelbarrows, we have what you need to tackle all of your Springtime gardening checklist. Let our expert staff help you find the right equipment for your DIY projects. As always, if you have any questions about what to choose, pricing or how-to’s, don’t hesitate to contact us. Stop by our store — we’re open seven days a week.